It is hard to avoid seeing the impact of social media on our daily work, from marketing and sales to customer service. Consumers and customers can interact on the Internet to share their experiences and opinions often and easily, but internally we in business are still operating in the era of electronic mail and phone calls. Fortunately, that archaic state is changing. A new generation of technologies called social collaboration has evolved from social media to adapt to business needs. These technologies include broadcasting like Twitter, posting to digital walls like Facebook, discussion forums and online communities, and chat-based interactions, all used in a secure manner by an organization’s workforce. Since social collaboration is about people interacting for a common purpose across processes, using it for human capital management makes a lot of sense. We recently concluded benchmark research on social collaboration and human capital management. In it we found that 58 percent of organizations now allow open social collaboration across the enterprise, while on the other hand 39 percent explicitly deny people the opportunity to interact using this technology. This gap illustrates the need for more education about how social collaboration can help organizations advance by allowing people to interact for a range of activities. The largest number of new hires in organizations over the next five years will come from a younger generation of workers called Millennials, who are used to engaging in collaboration and are unresponsive to electronic mail. Organizations will need to look at a spectrum of methods to fully engage their attention and realize their potential. Social collaboration has great promise for engaging and retaining organizational talent. If employees are enthusiastic about and satisfied with their roles, they contribute more value. Our benchmark research found that this attitude is the important workforce metric when it comes to organizations getting the most return from their human capital. However, my review of organizations’ workforce analytics efforts finds that key metrics such as satisfaction and engagement are not well-defined or tracked on a routine basis; most organizations that perform tracking do it on an annual basis. Clearly retaining talent is critical to an organization’s overall success, including the cost and financial impacts. Techniques such as social collaboration can help enhance these metrics and promote interaction and alignment of employees. Almost half of organizations in our research named knowledge sharing as the top purpose for social collaboration, followed by the basic function of collaborating. While this might sound obvious, some organizations nevertheless resist these trends while still using endless emails and meetings that are just slower and less direct means of social collaboration. As organizations assess the potential increase in productivity and performance from the use of social media, they should also consider that social collaboration tools must accommodate the varying technological competencies of their workforce, no matter what age or segmentation. This is no easy task, since most organizations employ people with a wide range of digital skills. Internally social collaboration is a human capital issue. Today, talent management applications cover performance, succession and learning, and attempt to align goals and tasks with performance objectives. Some organizations identify candidates for promotion based on their social engagement. Social collaboration also helps companies recognize employees’ achievements and promotions. 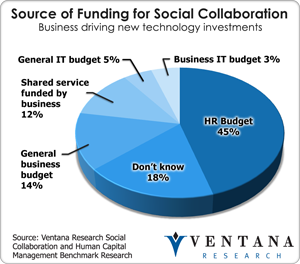 In the context of benefits like these, our research found that human resources is the source of social collaboration funding in 45 percent of organizations – that is, it comes from business budgets rather than IT’s. This is critical to note, as many general collaboration technologies have not aligned with the needs of business and so are being ignored or being acquired by other technology vendors. In my next post on human capital management I will outline some of the technological approaches to social collaboration and show how the use of cloud computing and mobile technologies have helped make these capabilities more easily accessible. I will also cover our new evaluation criteria for examining social collaboration for human capital management, to make it easier for everyone to evaluate methods to engage and retain their talent. I urge everyone to keep an open mind on what is possible with social collaboration. Look at it with a business lens on how it can improve the productivity and performance of your workers in ways not possible with existing approaches. Doing nothing in this area will inevitably have a negative impact on your organization.